Our Sun lies as the very heart of our Solar System. From its tremendous output of light and energies, all the planets, the Moon, asteroids and comets and shine brightly by simple reflection. Continuously and constantly generated in the Sun is solar energy, allowing for the Earth’s stable environment that harbours and sustains all terrestrial life. Importantly, our Sun is a star, similar to all the ones appearing in the nighttime sky. Obviously, the difference is that the Sun is very much brighter due to its close proximity to the Earth. The next nearest star is nearly 40,000 times the distance between the Sun and the Earth, being the Alpha Centauri triple system, where Proxima Centauri now happens to be just slightly closer at 4.3 light-years. Some other stars we see in the night sky are similar to the Sun, but the vast majority are hotter or cooler, larger or slightly smaller, brighter or less luminous. Radius : 696 850 km. Diameter : 1 393 700 km. Age : 5.0 billion yr. In our Milky Way galaxy, astronomers consider our Sun is just an ordinary yellow dwarf star with no particular outstanding or unusual peculiarities, and no favourite position among all stars. Having a smaller mass like the Sun does produces one huge advantage — as the energy will last between eight and ten billion years, unlike the largest stars, which have much shorter lifetimes. Our Sun at present is only about halfway through its evolution, and still lies with 80% of known Main Sequence stars. In the far distant future, several billions of years from now, the Sun will gradually begin swell in size, to enlarge itself into a red giant that is roughly the size of the Earth’s orbit. The Sun does and has, however, slightly fluctuation in brightness over historical time — contributing to the Ice Ages known have occurred many times in the past from changes in ice cores and the geological record. Earth’s present warm climate might also be affected by short-term changes such as the solar cycle and the number of sunspots visible on the solar disk. 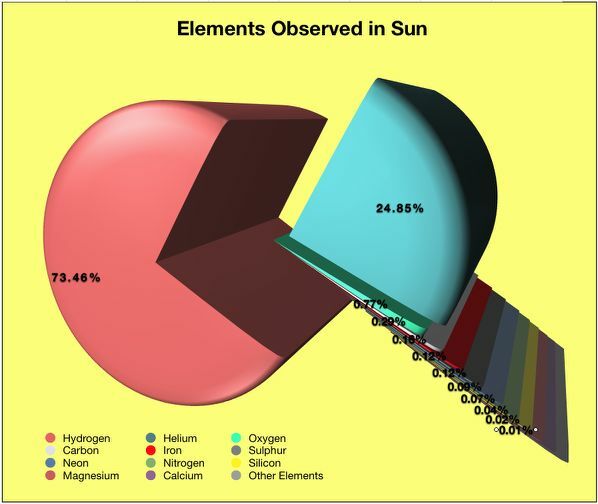 The entire volume of the solar sphere occupies a ball of very hot gases that is primarily made from two main elements; Hydrogen (73.46%) and Helium (24.85%). This is 98.21% of the solar mass, with the remaining 1.79% being all the other chemical elements. Comprising the outer observed ‘surface’ is the photosphere, whose effective temperature is 5778K. In the central radiative core, this temperature rises to an approximately fourteen million degrees. In many of the early human cultures, the people openly and reverently worshipped the Sun as their supreme deity or god. Most of this devotion gave thanks for its glorious rays of warm light, whose appreciation and daily grace allowed all the peoples of the Earth to continue to live and thrive. No doubt there was always some real fears that if the Sun was not properly honoured or appeased in some way, then the sun god may become angry enough to extinguishing its important light — plunging the Earth into permanent darkness. The occasional solar eclipse probably perpetuated this idea, that always seemingly threatening to consume its light forever. In the Middle-eastern countries the most influential early gods was the Mesopotamian god Utu or Shemash and the Hittite Arinna or Hebat. Later in Persia, the god was Mithras To the Indian Hundu, the god was Surya. In South America, the Incas called the sun god Inti, while to the Aztecs he was Tonatiuh or Huitzilopochtli. For the Ancient Egyptians the sun god was Re or Ra, whose usual headdress adorns a large red solar disk. For a short time under the renegade pharaoh Tutmosis IV, this Egyptian god was the Aten. Later they changed the single god into three different names that depended on the place of the sun in the sky; namely, Khepri when rising from the east, Ra at midday, then Atum when the sun was setting. To the Greeks he was Helios or Hellus, and for the Romans, Apollo, being the son of Zeus/ Jupiter with his sister Selene / Diana (The Moon). In a broadly held legend, he would daily ride his brilliantly illuminated chariot across the sky under the power of his four powerful celestial horses; which the Greeks named Pyrious, Aeos, Aethon and Phlegon. Religious veneration of the sun god occurred each year on the 9th August, either at the main temple at Delphi or at the dedicated shrine in the Circus Maximus. By the 1st Century A.D., the Romans had changed their sun god to Sol Invictus (the literal “unconquered sun”) Sol, which probably originated in Syria. Quite separate from Apollo, Sol was to be adopted into the Roman pantheon of gods and was worshipped at the temple of Campus Agrippae in Rome until the rise of Christianity in the latter half of the 3rd Century. Sun worship finally ended at the fall of the Roman Empire. Matter within the solar core is very unlike anything in the rest of the Solar System. It exists in the environment of very high temperatures and pressures as ultra-hot plasma, described as the fourth state of matter. Electrons that normally orbiting around the atomic nuclei, are easily taken away under these conditions, leaving highly ionised nuclei. Most of these highly positively charged nuclei repel or deflect from each other by the atomic strong nuclear force. A few of these atomic particles can crash energetically together, sometimes hitting so hard that the kinetic energy overwhelms the strong nuclear forces forcing them to fuse together, creating heavier atoms as different chemical elements. This is the important energy generating process known as fusion, while creating elements are generally referred to in astronomy as nucleosynthesis. Within the solar core dwell vast stores of hydrogen, where several million tonnes of hydrogen converts to the heavier helium each second, whose dynamism creates copious amounts of energy. In the core, only a very small percentage of the atomic mass is destroyed, whose net outcome liberates stupendous amounts of energy. Generated solar energy in total is 6×1026 Watts each second, so in this particular view, the Sun is really a gigantic power plant of light and heat. Discovery of these huge liberated energies made via fusion was found by Albert Einstein in 1905 through his famous mass-energy equivalence equation E =m×c2 (energy equals mass times the speed of light squared), as first published in the landmark paper; “Does the inertia of a body depend upon its energy-content?” With a typical 600 MW (megawatts) nuclear power station, our Sun produces 1012 MW — or one trillion or 1,000 billion times more energy every second! If just one gram (1.0 g.) of matter were converted into pure energy, the total power released is equal to twenty-five (25) million kilowatt-hours or about 9×1016 Joules of energy. Comparing to the average quarterly power bill of 2,000 kilowatt-hours, this is 12,500 times more in total energy consumption. At, say, 12 cents per kW the amount (2008), this is equal to about $3,000,000 worth of consumed electricity or 50,000 consecutive power bills, and enough power for 12,300 years! So if we based our calculations on the entire net electricity generation on Earth in 2004, by all sources, it was predicted to be 1.665×1013 kW-hours (or 16,650 billion kW-hours) then it would take the equivalent of converting 655 kilograms of matter into pure energy each year, 1.8 kilograms per day, or just 21 grams per second — merely using 950 trillionth of the solar energy production in the same second! Just Amazing! It is interesting that this consumed energy is 1.5102×1013 kW.hours (15.102 trillion kW.hr. ), meaning the energy lost is about 1,540 billion kW.hr or 9.3%. This significant loss is probably due to energy transmission leakage through power lines or from heat dissipation. Hydrogen is not the only element fused this way, as there are other rarer conversions, but this normally requires higher core temperatures. (They can occasionally occurs at lower temperatures, but the probability of this happening decreases rapidly.) These different processes are established reactions that also occur in other stars. Here the Hydrogen is converted into Helium, then next is Helium into Carbon, Carbon into Silicon, and finally Silicon into Iron. Many sub-reactions can also exist, where, for example, Helium can convert into either Oxygen or Nitrogen (and rarely, Fluorine), etc. Simplistically, the Sun is an element chemical factory, manufacturing all the common elements that are found on the Earth and found within our human bodies. Once these energies reach the solar surface, it radiates light equally into all directions into space. Our Earth receives only very tiny fractions of this energy, but despite the distance of about 150 million kilometres, the amount received is so intense that the retina of the eye can be quickly damaged causing irreparably and permanent blindness. Also ultraviolet radiation begins to disrupt external body cells like skin. Direct viewing of the Sun, by either eye or any other optical equipment, is VERY DANGEROUS without proper eye protection. Otherwise, TOTAL BLINDNESS WILL RESULT, and even glancing will blind you in less than a ten-thousandth of a second. 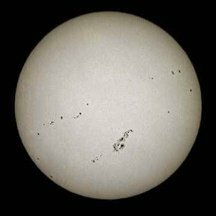 If your telescope has something called a SUN FILTER — NEVER USE IT !! If this filter were to crack while you are observing the Sun, INSTANT blindness is the only possible outcome. The user applying this data for any purpose forgoes any liability against the author. None of the information should be used for regarding either legal or medical purposes. Although the data is accurate as possible some errors might be present. The onus of its use is placed solely with the user. Those not heading the given important warnings written in red on this page do so at their own risk.